by William L. Tafoya, Ph.D. Anyone ever misquoted recognizes the importance of context. Wrong assumptions about concepts, words, and phrases easily lead to misunderstanding. In the law enforcement community, officers who use a weapon in the line of duty to defend themselves or innocent bystanders may kill but not murder. Context often serves as the crucial variable justifying the use of deadly force. Murder is always killing, but killing is not always murder. Similarly, accurate knowledge of the context and targets of cyber attacks enhances clarity and helps to avoid obscuring intent. “Cyber terrorism is a component of information warfare, but information warfare is not...cyber terrorism. For this reason, it is necessary to define these topics as separate entities.”1 Said another way, undefined and misunderstood terms easily could lead a conversation to proceed along parallel lines rather than an intersecting track. Thus, differentiating concepts and terms is important, as in the case of understanding what cyber terror is and what it is not. IW has several variants. Electronic warfare (EW), primarily a military term, is older than IW and dates back to World War II. Information operations (IO) is the more contemporary military nomenclature. EW and IO both are synonymous with IW. None of the three, however, are synonymous with cyber terror. 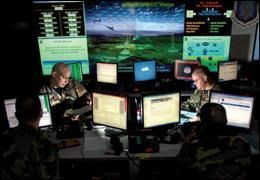 IW, EW, and IO encompass the use of cryptography (cryptology and cryptanalysis), radar jamming, high-altitude aerial reconnaissance, electronic surveillance, electronically acquired intelligence, and steganography. Cyber terrorists may use these same tools. The distinction, however, is not the technological tools employed but the context and target. In 1991 during Operation Desert Storm, coalition forces used IW, EW, and IO through the clandestine introduction of viruses and logic bombs into Iraqi Republican Guard (IRG) command-and-control-center computers and peripherals, causing the disruption and alteration of the targeting and launching of Scud missiles.5 Military combatants engaging one another on the battlefield constitutes IW, EO, and IO. Attacking the largely civilian critical infrastructure is not warfare, but terrorism—cyber terror. But, how does cyber terror differ from IW, EW, and IO? Dr. Tafoya, a retired FBI special agent, is the coordinator of and a professor in the Information Protection and Security Program at the University of New Haven in Connecticut. As an illustration in size, this article does not compare to the holdings of the Library of Congress. The loss of the former would be traumatic to the author, but would impact few other people. Loss of the latter, likely irreplaceable, would prove devastating if a cyber attack deleted those files. Of course, neither could compare to the loss of one human life. But, if data or information from any of the nation’s critical infrastructure databases were attacked and destroyed, that certainly would impact quality of life. What are the most vulnerable targets of cyber terrorists? What constitutes the significance of the targets and the magnitude of the threat? Does it matter what the threat is called? Does cyber terror constitute an element of computer crime? Along the time continuum, this is where the line begins to blur between “conventional” computer crime and what the author refers to as cyber terror. This genus includes the Melissa Virus (1999), ILOVEYOU Virus (2001), Code Red Worm (2002), Blaster Virus (2004), and Conficker Worm (2008). These attacks differ from extortion, fraud, identify theft, and various scams, all of which certainly are malicious. However, acts of cyber terror as here defined impact society—even the nation—not just an individual, elements of the business sector, or government agencies. Clearly, law enforcement agencies need to stay well informed about what the experts think. Most contemporary professionals remain cautious. However, if people wait until they have absolute proof positive, it may be too late. The cyber trends seem clear. Over the course of approximately 13 years, both the number and frequency of instances of digital disorder have intensified, and the sophistication and diversity of types of cyber attacks have increased. One high-profile specialist contended that “stories of terrorists controlling the power grid, or opening dams, or taking over the air traffic control network and colliding airplanes, are unrealistic scare stories.” He went on to invoke a cost-benefit ratio perspective: “We need to understand the actual risks. Here’s the critical question we need to answer: Just how likely is a terrorist attack, and how damaging is it likely to be?”15 Another authority notes that “threats to the critical infrastructure are becoming increasingly frequent” and goes on to say, “Cyber attacks are one of the greatest threats to international peace and security in the 21st Century.”16 Where there is smoke, is fire not obviously far behind? And, what about the future? What technological innovations will impact the ability to serve and protect in the near-term future? Concerning the use of the term cyber terror, do experts resemble the proverbial blind men who feel different parts of the same elephant? On the near-term horizon, technological wonders will arise of which the unscrupulous will avail themselves, just as others before them have done.17 But, where do vulnerabilities lie, and what technological tools will terrorists use? Not the only concern, but certainly a major worry, are supervisory control and data acquisition (SCADA) systems. Closely related are digital control systems (DCS) and programmable logic controllers (PLC). SCADA systems are more ubiquitous than personal computers and laptops combined. Without onsite human intervention, they automatically and remotely collect data from sensors in devices used for industrial processing. They store information in databases for subsequent central-site management and processing. Electromagnetic pulse (EMP) bombs and high-energy radio frequency (HERF) weapons differ from the malicious codes, computer viruses, and worms of yesteryear. While the latter remain worrisome, EMP and HERF are serious menacing perils of the near-term technological age. EMP devices are compact, and perpetrators can use them to overload computer circuitry. These devices can destroy a computer’s motherboard and permanently, irretrievably erase data in memory storage devices.21 Like EMPs, HERF devices use electromagnetic radiation.22 They, too, deliver heat, mechanical, or electrical energy to a target. The difference is that individuals can focus HERF devices on a specific target using a parabolic reflector.23 HERF, as asserted, does not cause permanent damage—EMP does.24 An array of demonstrations of the power of such homemade devices is depicted at several Web sources, such as YouTube. Two decades ago, an expert warned about Internet agents, including bots (robots), Web crawlers, Web spiders, and Web scatters, software apps that traverse the Internet while undertaking repetitive tasks, such as retrieving linked pages, specified words or phrases, or e-mail addresses.25 Although bots have served benign functions—for example, harvesting e-mail addresses—for many years, they now loom large as a near-term future IC and policing issue. More recent research supports this contention. Given these forecasts, the question is not what might happen tomorrow, but, rather, how well-prepared law enforcement will be to protect and serve. Federal agencies responsible for investigating terrorism, including cyber terror, must remain vigilant. This includes ensuring adequate funding for staffing, equipment, and training. But, beyond that, local law enforcement officers must encourage citizens to be alert and to report suspicious behavior. Many local law enforcement agencies have had useful resources, such as citizens’ police academies, for decades. These programs can educate taxpayers about activity in the physical realm that should be reported. However, what about transcendence to the virtual realm? Since 1996, the FBI’s InfraGard Program, an information sharing and analysis effort, has focused on marshaling the talents of members of America’s information security (INFOSEC) community.26 However, what of “main street USA”? See Something, Say Something is a terrific crime prevention slogan promoted in New York City.27 It seems to have resonated recently in Times Square when an observant man, a street vendor and Vietnam veteran, alerted the New York Police Department to the SUV used in what turned out to be, fortunately, a failed Taliban-sponsored car-bombing attempt.28 Any such program should be augmented to provide to its participants examples of behavior in the business community, including those in a work environment, that could alert authorities to precursors of potential cyber misdeeds. Just as someone does not need specialized education to recognize threats in real life, anyone can recognize these digital threats. One authority notes that “an example of suspicious behavior might be a bit of malicious program attempting to install itself from opening an office document.” To reduce the threat, employees could add a “‘behavior’ layer to [antivirus products].”29 Of course, this suggestion could unnerve many civil liberty-oriented watchdog organizations; there is no reason not to include such agencies in the discussion, planning, and implementation of the augmentation here proposed. What, then, is the bottom line? Earthquakes, hurricanes, tsunamis, tornadoes, volcanoes, toxic spills, forest fires, and shark attacks do not occur with great frequency. Precautions, nevertheless, are in place to protect people from the physical threats posed when these natural but seldom-occurring violent events occur. Although they cannot be forecast with great accuracy, we are prepared for them. Similarly, law enforcement agencies should be prepared to deal with the aftermath of hard-to-forecast, but not regularly reoccurring, cyber attacks on the nation’s critical infrastructure. Cyber terrorists are pinging ports and probing our digital fortifications as they endeavor to identify vulnerabilities. Daily crackers and terrorists are skulking, battering firewalls, and learning more each time they do so. Clearly, preparations to thwart such attacks are necessary. The skills, tools, and techniques are the same, but information warfare is conducted between military combatants; cyber terrorism targets civilians. Cyber terrorists indiscriminately will attack the nation’s critical infrastructure and civilians—the innocent. Thus, the context and targets, not the technological tools or frequency of attacks, are the more appropriate delimiters that distinguish cyber terror from information warfare. Some of these criminals are being caught and prosecuted, but more remain undetected. To best serve its motto, “to protect and serve,” law enforcement must proactively guard this country’s national security on every front. 1 Robert Taylor, Eric Fritsch, Tory Caeti, Kall Loper, and John Liederbach, Digital Crime and Digital Terrorism (Upper Saddle River, NJ: Pearson Prentice Hall, 2011), 19. 2 Dorothy Denning, Information Warfare and Security (Reading, MA: Addison-Wesley Longman, 1999), 21. 3 Maura Conway, “Cyberterrorism: Hype and Reality,” in Information Warfare: Separating Hype from Reality, ed. E. Leigh Armistead (Washington, DC: Potomac Books, 2007), 73–93. 4 Wang Baocun and Li Fei, “Information Warfare,” Academy of Military Science, Beijing, China, http://www.fas.org/irp/world/china/docs/iw_wang.htm (accessed October 28, 2010). 5 Denning; and Alvin and Heidi Toffler, War and Anti-War: Survival at the Dawn of the 21st Century (Boston, MA: Little, Brown, 1993). 6 Barry Collin, ”The Future of Cyberterrorism,” Crime & Justice International Journal (March 1997): 15. 7 James Lewis, “Assessing the Risks of Cyber Terrorism, Cyber War and Other Cyber Threats,” Center for Strategic and International Studies, http://csis.org/files/media/csis/pubs/021101_risks_of_cyberterror.pdf (accessed October 28, 2010). 8 Dr. Grace Hopper, “Future of Computing” (lectures, FBI Academy, Quantico, VA, 1985-1991). See also http://www.sdsc.edu/ScienceWomen/hopper.html (accessed October 29, 2010); http://www.youtube.com/watch?v=7sUT7gFQEsY (accessed October 29, 2010); and http://www.youtube.com/watch?v=CVMhPVInxoE&feature=related (accessed October 29, 2010). 9 Mehwish Salim, “Cyber Terror: Unequivocal Threat or Hyperbole?” (award-winning paper presentation, 34th Annual Meeting of the Northeastern Association of Criminal Justice Sciences, Bristol, RI, June 9-12, 2010). 10 David Pettinari, “Cyber Terrorism-Information Warfare in Every Hamlet,” Police Futurist 5, no. 3 (1997): 7-8. 11 National Security Council, “The Comprehensive National Cybersecurity Initiative,” http://www.globalsecurity.org/security/library/policy/national/cnci_2010.htm (accessed October 29, 2010); and CBS, “Sabotaging the System,” 60 Minutes, http://video.techrepublic.com.com/2422-13792_11-364499.html (accessed October 29 2010). 12 Donn Parker, Crime by Computer (New York, NY: Charles Scribner’s Sons, 1976). 13 Ronald Standler, “Computer Crime,” http://www.rbs2.com/ccrime.htm (accessed October 29, 2010). 14 U.S. v. Mitra 04-2328. 15 Bruce Schneier, Beyond Fear: Thinking Sensibly About Security in an Uncertain World (New York, NY: Copernicus Books, 2003). 16 Jeffrey Carr, Inside Cyber Warfare (Sebastopol, CA: O’Reilly, 2010). 17 For more information, visit http://www.battelle.org. 18 Gregory Coates, “Collaborative, Trust-Based Security Mechanisms for a National Utility Intranet” (master’s thesis, Air Force Institute of Technology, 2007). 19 William Graham, Chairman, Critical National Infrastructures, “Report of the Commission to Assess the Threat to the United States from Electromagnetic Pulse (EMP) Attack,” EMP Commission, http://empcommission.org/docs/A2473-EMP_Commission-7MB.pdf (accessed October 29, 2010); Seth Fogie, “SCADA and Security,” http://www.informit.com/guides/content.aspx?g=security&seqNum=322 (accessed October 29, 2010); and Seth Fogie, “SCADA In-Security,” http://www.informit.com/guides/content.aspx?g=security&seqNum=323 (accessed October 29, 2010). 20 Tom Longstaff, “Cyberwar: Vulnerability of Scada Systems?” http://www.pbs.org/wgbh/pages/frontline/shows/cyberwar/vulnerable/scada.html (accessed October 29, 2010). 22 For additional information, see http://www.lbl.gov/MicroWorlds/ALSTool/EMSpec/ (accessed October 29, 2010). 23 For additional information, see http://www.wordiq.com/definition/Parabolic_reflector (accessed October 29, 2010). 24 John Geis, “Directed Energy Weapons of the Battlefield: A New Vision for 2025” (paper, Center for Strategy and Technology, Air War University, Maxwell Air Force Base, Alabama, 2003). 25 Kevin Manson, “Robots, Wanderers, Spiders and Avatars: The Virtual Investigator and Community Policing Behind the Thin Digital Blue Line” (presentation, annual meeting of the Academy of Criminal Justice Sciences, Louisville, KY, March 15, 1997). 26 For more information, visit http://www.infragard.net. 27 For more information, visit http://www.mta.info/mta/security/index.html. 28 “President Calls to Thank Times Square Vendor,” Associated Press, May 2, 2010; and Anne Komblut,“Pakistani Taliban Behind Attempted Times Square Car Bombing, Attorney General Says,” Washington Post, May 9, 2010.
security-expert-urges-shift-in-tactics-against-cyber-attacks-206747-eng.html (accessed October 29, 2010). 30 John Arquilla and David Ronfeldt, Swarming and the Future of Conflict (Santa Monica, CA: RAND, 2000); and John Arquilla and David Ronfeldt, “Fighting the Network War,” Wired 9, no. 12 (2001). 31 Kim Zetter, “Google Hackers Targeted Source Code of More Than 30 Companies,” http://www.wired.com/threatlevel/2010/01/google-hack-attack/ (accessed October 29, 2010). 32 Kim Zetter, “Report: Critical Infrastructures Under Constant Cyberattack Globally” http://www.wired.com/threatlevel/2010/01/csis-report-on-cybersecurity/ (accessed October 29, 2010). Heute waren schon 6 visitors (137 hits) hier!